an incoming tide? Or does it send a message of resilience? I then went 180 degrees and embraced the thought that “hope is not a strategy” and is not conducive to progress. It can be, I thought, a comfortable rationalization for inaction. This past week I had a conversation with a colleague who is grappling with some professional challenges. We both had recently heard a speaker focus on the power of hope. Hope for the future. Hope for improvement. Hope for a meaningful life. Hope for a good job. Hope, hope, hope. My friend said that was nice—but he needed a plan to move through and beyond his challenges. “Hope” would not do the job. A little over a year ago, a dear friend battled a disease that would in short order kill her. While walking on the beach, my wife wrote the word hope in the sand and took the above photo. So many ways to look at that. 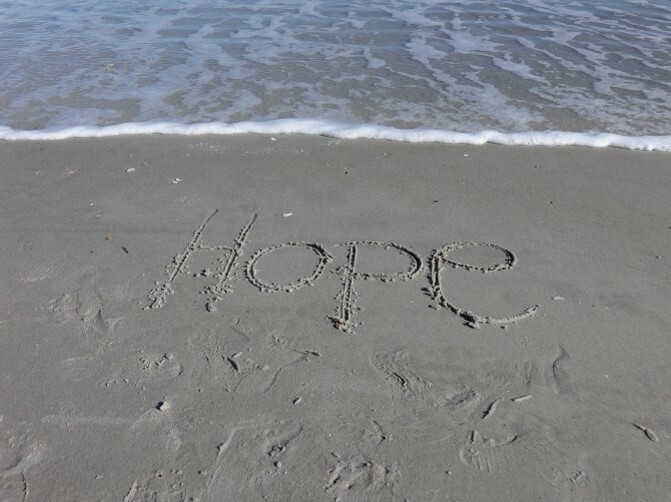 Is hope just a word that will soon be washed away by an incoming tide? Or does it send a message of resilience? I’ve come to believe that hope can be a powerful source of inspiration. In some cases, it might be the last thing separating a person from desperation and just giving up. HOPE can be the fuel that keeps our head up in times when we are confused, angry, and/or tired. Nice. But to that we must add a PLAN. What do we need to put in place in order to move out of the (desperate) situation we find ourselves? Again, the plan (or goal) represents a start but it must be accompanied by ACTION. What will you actually do to move your goal from words to your desired DESTINATION? So to answer my question in the title above: Hope can be a meaningful sentiment as long as it is accompanied by a well-thought-out plan that is put into action to move toward the destination. Hope, to me, can be a powerful fuel. But like the fuel in your car, it will not move you forward unless you put yourself in gear, step on the gas, and navigate down the road. This week, keep hope in front of you. This entry was posted in courage, hope, life success, Passion, Personal growth, Personal Wellbeing, resilience and tagged courage, dreams, focus, forward movement, hope, motivation, resilience. Bookmark the permalink. 1 Response to (#259) Is “Hope” a Meaningless Sentiment?